I have been in the investment business since 1986 and have been a chief investment officer for over 20 years. And I cannot recall a time in which the stock market was both this dangerous and fruitful at the same time. Yes, we've always had volatility (well, except maybe in 2017 when it took a "gap year" like kids do after high school). But volatility today is different. It is driven in large part by value-insensitive market players that care far less about what they are buying than that they are buying it, or selling it, or both within minutes. This is what the financial adviser of today and their clients must come to grips with. And it is a blessing and a curse. But more than anything, I think it creates confusion and overconfidence. Those two things are related because the investor and adviser conflate success in the stock market over a short, fixed period of time (a calendar year, a quarter, etc.) without considering that markets are, like life, inherently cyclical. This is a great time to really hone in on one's true objectives for their accumulated wealth, and make darn well sure that their approach to the 21st century realities of high-frequency trading, massive amounts of assets invested similarly (S&P 500, we're talking to you! ), and an economy that continues to take advantage of every opportunity to exploit what is left of the easy money central bank policies of the past decade. Put it all together, and it spells, again, a market that is fruitful -- until it quickly turns dangerous. December 2018 was a crash-test of sorts. I don't know when the next one will be, but I do hope you saw that as a great time to take account of what you own, why you own it, and draw a straight line between that portfolio and your ultimate objectives for those assets. For some additional perspective, consider that our move to the "Stormy" (most bearish) reward-risk tradeoff indicator celebrated its 1-year anniversary in late January. That 12-month period has seen a big pickup in volatility, bond rates dancing all over the place and generally negative returns across most asset classes. So yes, we do believe that "Stormy" is still the right classification for the current investment climate. We continue to sit on the edge of the defensive extreme zone of our portfolio positioning. Higher than normal short-term cash & equivalent investments and extreme selectivity in equity portfolios remain the priority. Listen to Rob Isbitt's podcast with Robert Powell, editor of TheStreet's Retirement Daily, here. January was a terrific month for the U.S. stock markets around the globe. Really, it started on Christmas Eve of last year, and that 5-week period created a monster rally. That type of V-shaped rally reminds me more of what happens in bear markets than bull markets. After all, if you lose 20% as the S&P 500 did last autumn, you are only working with 80 cents on the dollar thereafter. And that means you need to make 25% just to get even with where you peaked. January was a big step in that direction, and now we will see what the encore looks like. This is still a wounded bull, and the sharper the rallies, the more it reminds us of classic bear-market behavior. Fierce, quick rallies of 10% are still quite possible, as that is a staple of bear market cycles. But a run to much higher all-time highs is far less likely. Be ready for anything. January put another fly into the ointment of the theory that interest rates will just go up and up from here. As it turns out, rates of all Treasury maturity levels dipped to start the year. But this is a good time to remind you that a bond bear market (which we believe we are in) does not mean that rates must go straight up. Heck, the last bond bear was so long ago (it ended in 1980) that investors don't remember that rates crawled higher before spiking higher as time went on. Later, as the failure of both governments and market pricing to address the excesses created were actually addressed, the follow-through was pretty nasty. Corporate bonds, convertible bonds, high-yield and even senior loans are susceptible to the next debt crisis. Please do not assume that is years off, even if that turns out to be the case. 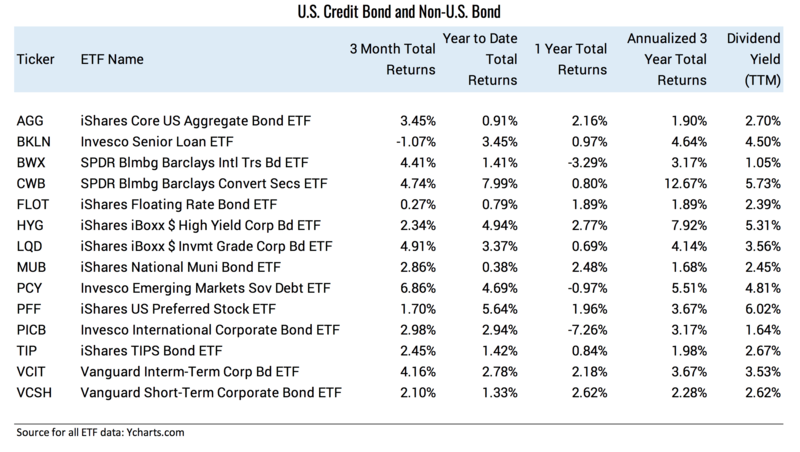 At a time when bond rewards have been high since the early 1980s, it is easy to miss the gradual deterioration in bonds as a helpful investment class for boomers and those within 10 years of retirement. Reach for yield at your peril. There are always places to make positive returns. What is remarkable about the period we appear to have entered in market history is that the sources of such returns at a moderate level of near-term risk are ever-fleeting. 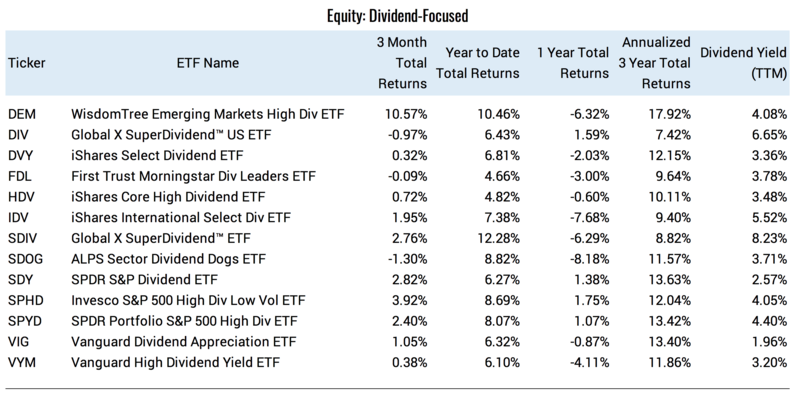 In other words, your portfolio's hero this month can be its goat the next month. As evidence, I point to December of 2018, and January of 2019. The old-reliable signal of coming recessions is the spread in rates between 2-year and 10-year U.S. Treasury securities. As of January-end, that spread was down to just 0.18% (18 basis points). But we don't need a recession to be formally declared to freak out markets. All it takes is a sufficient level of fear that one is coming. As they say, the markets are forward-looking. But they will not look forward to that, so to speak. For many portfolios, a combination of long-term and tactical investment strategies is the preferred approach in the foreseeable future. Buy and hold investing is not dead by any means. 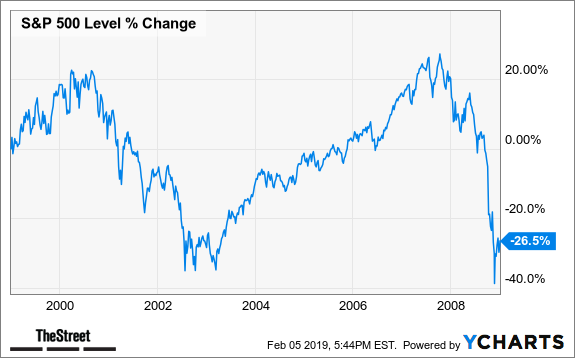 But it has to be reconciled with the dramatic increase in investor impatience and complacency that is natural after the decade-long run in the S&P 500 and a second-generation-long run in bonds. 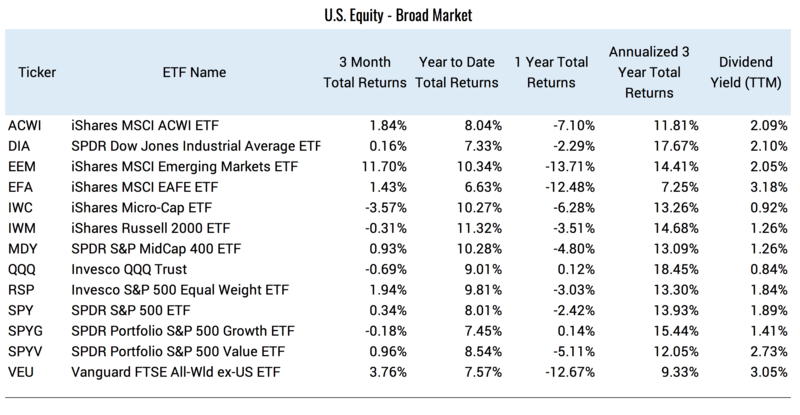 In addition, the benefits of ETFs as both core and tactical investment tools (in the right hands, of course) are growing versus that of individual stock selection. Blame the machines and quarterly earnings reactions by those machines and human investors for that. The game has changed, and we had best change with it. No financial adviser or investor wants to be a dinosaur. Remember when the U.S. stock market went long periods of time without making money? Many investors don't and that's a problem. The combination of a fearless investing public and the addition of more powerful electronic trading forces is a recipe not for disaster, but for a roller-coaster of emotions for many. 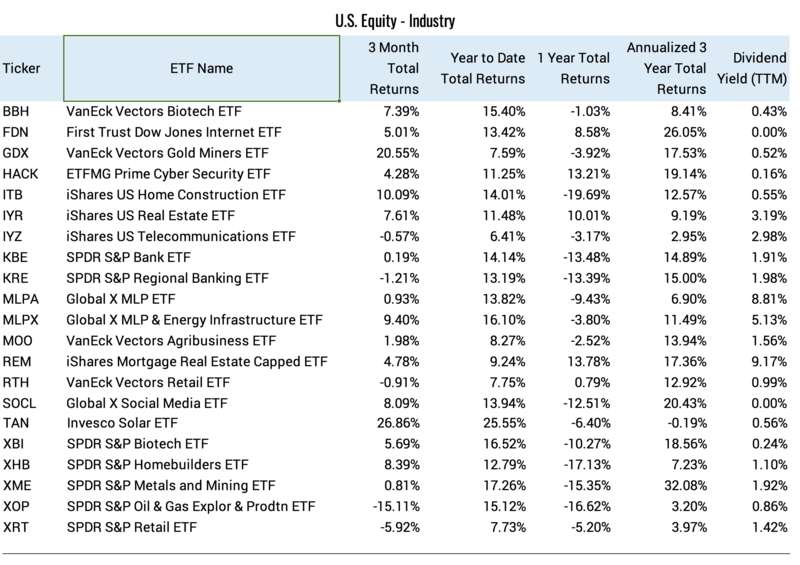 This is a group of 100 ETFs I track to get a general sense of global market conditions for investors. over the time periods shown. This group in total had a stellar January, up nearly 8%. That's the statistical picture of a "V-bottom" as it followed an 8% decline in the 12 months prior. Smaller companies and Emerging Market stocks paced the month, which is a good sign of "risk-on" behavior, at least for the past 5 weeks. But as the 1-year return column shows, it was more a matter of making back some of what was lost. It will take more than a good month to dig out of the mud of late 2018. After all 21 of these were in the red during 2018's 4th quarter, every one of them was up in January. That's good news, unless you are concerned that markets are correlating too much. High-beta stocks romped in January and are now "only" down about 10% over the past year. They are one of the poster-children for the V-shaped bottom theory and will either lead much higher or resume their plunge relative to the other thematic types. Ex-India's market, the rest of the world had a fun January. Also note that the non-U.S. markets are on a different type of cycle with the U.S. They fell first and rallied first over the past year. Let's see where that relationship goes next. I suspect the fate of the U.S. Dollar will have a lot to do with it. Gold appears to be ready to lift off in a way it hasn't in years. But every V-shaped rally in stocks delays that move, unless the market decides that gold's anti-U.S. Dollar appeal is more important. About the author: Rob Isbitts is the chief investment officer of Sungarden Fund Management, the subadviser to a long-short mutual fund (DNDHX) and the founder of Sungarden Investment Research, an investment management and equity research firm. Over the past three decades, he has managed daily liquid portfolios through diverse market conditions. I created several investment strategies, including the Sungarden Hedged Dividend portfolio, an alternative approach to the pursuit of income, preservation and long-term growth. I have authored two books: "Wall Street's Bull and How to Bear It" (2006) and "The Flexible Investing Playbook" (2010), plus over 300 articles on investing. I can be followed on Twitter @robisbitts, and my website is www.sungardeninvestment.com. I also co-host the Investing Evolution Podcast.